When my twin sons were 3 years old in 1984 I got them two Playmobil sets and extra track. So that they could both run the trains over the same track at the same time, and not have to know about isolation sections I invested in an Airfix Multiple Train Control System that was produced from 1978/9. The Multiple Train Control System consists of a main control unit that can control up to sixteen locomotives, but only a maximum of four can be controlled at any one time with plug in hand controllers. There are also modules to fit into the locomotives. As time went on we bought more train sets and extra Locomotives and stock. I have been using this system now for many years to control my G gauge Playmobil locomotives. The advantage of the system is that four operators can control four locomotives independently at the same time. Over the years we have increased our stock of Playmobil locomotives and trains. 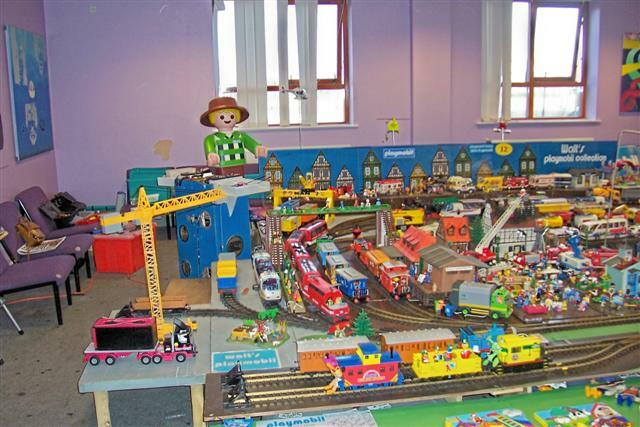 However when we took the old Playmobil layout to exhibitions we run it as a “DRIVE IT YOURSELF” layout for children. Usually only allowing one train to be operated at a time to avoid crashes. 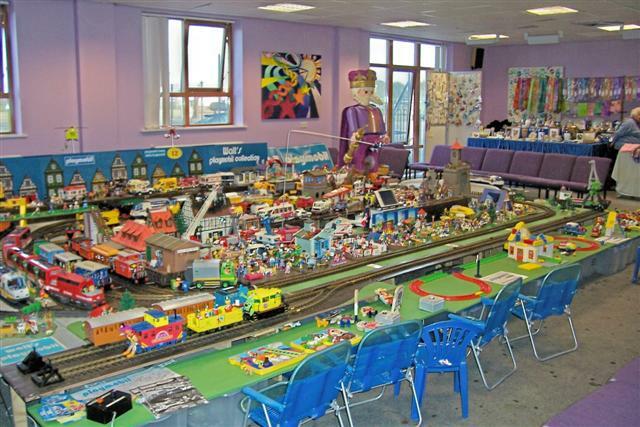 We started exhibiting the Playmobil trains in 1998 when there was a model railway exhibition held locally. The following year we were asked to exhibit the trains again, we had also took it out to other exhibitions. The third year we were asked to go again, so once more a layout was designed to fit the tables that we would be lent. However we had been told the size was 2m x ½ m, when we got to the hall the tables were 6 feet x 2 feet. We then had to spend 3 hours redesigning the layout to fit. We were now being asked to go to different venues, so I decided to have our own boards. The first year the boards were not painted but later we painted them. As we had had to lift up our children when we used to take them to model railway exhibitions, it was decided that the boards should low enough for children to be able to see the over the top of them without having to be lifted up by their parents. The boards also had to fit into the small trailer we had. A height of 13 inches was decided upon and the boards made. The track was fastened to the boards. When making the boards we decided to expand the system. To increase the number of Playmobil locomotives and trains that could be run to eight. The old exhibition layout now has two main control units but only one is connected to the track at a time. On the top of the control panel I have push buttons and four hand controllers. By pushing a button for the locomotive or train that the children require to drive, relays are operated that set the points correctly, set the hand controllers to the correct main control unit and connect it to the track. I have modified the hand controllers so that they will only operate in one direction, so if children try to reverse the train it only stops. Into the hand controller is fitted a small socket and when I insert a plug in the train will reverse. This is handy for testing the trains and also if they need to be reversed. Should the train have lights on them then these are left connected to the pick-ups from the track. Originally the layout was made so that it could be viewed all round, but later it was modified so that it could be viewed from the front and sides. It was nice to see the faces of the children when they find out that they can operate the layout. We also had a short end to end line for the younger children that could be operated by pushing a button.